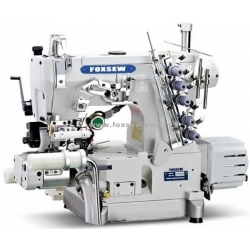 FOXSEW Direct Drive Cylinder Bed Interlock Sewing Machine Right Side Cutter with Rear Puller and Tension Roller for Elastic Attaching, Automatic Thread Trimmer. Direct Drive Right Side Cutter Pneumatic Auto-Trimmer Interlock Machine with Rear Puller and Tension Roller for Attaching Elastics on Waist of Men's or Woven's Clothes. Cylinder Bed Interlock Sewing Machine Right Side Cutter, Rear Puller and Tension Roller, Automatic Thread Trimmer, for Elastics Attaching. 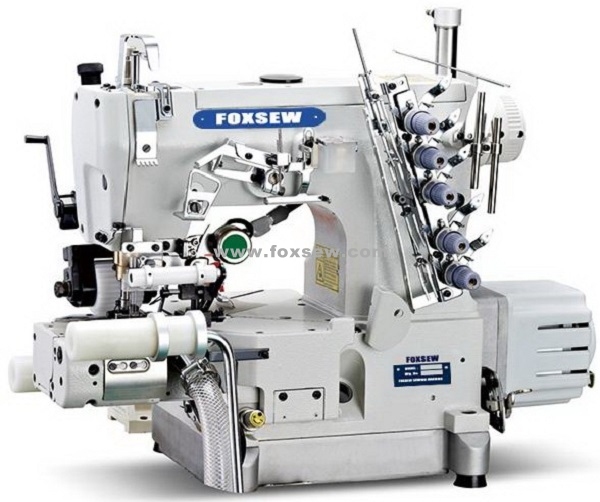 This machine is specially used for attaching flat elastics to tubular goods made of light to medium weight fabrics, such as the waists of briefs, etc... Equipped with a rear puller (RP) and fabric tension adjuster tension roller, the machine can attach flat elastics smoothly to the fabric body even if the size of those materials are different. The fabric edge trimmer (FT) trims the edge of the fabric during sewing, producing a clean finish on the edge of the fabrics.